My kitchen is tiny and I don’t have a lot of bench space. If the kitchen tools are not out on the bench, in my experience they tend not to get used. So, I’ve been having a major kitchen cleanup, selling some old appliances and tools that I don’t use, and using those to fund the purchase of two new toys, a shiny red KitchenAid mixer with a couple of attachments and a Braun stick blender that can also operate as a food processor. So far I’ve used the mixer to knead some bread and produced the best bread I’ve ever made and used the slow juicer attachment several times. I also have a pasta roller attachment so I will be experimenting with some vegan fresh pasta. That’s for later though. Right now, the tool that has had the most use is the stick blender/food processor. I’ve made a large batch of pesto from the bounty of basil in my garden and made great latkes with 15 secs of processing. On the latkes front I was going to make some for dinner with some kale on the side. Instead I grated up the potato, kale and some spring onions (all from the garden) 🙂 and made an all-in-one meal. I ate them with some of the pesto and a fresh tomato salad made with the early tomatoes that are starting to appear. Heat the oil in a large frying pan until smoking hot, then turn down the heat down low. It is important to cook the latkes over a low heat so that the insides are cooked before the outside burns. I love my stick blender too, and it gets lots of use! I love that mine has a food processor attachment that the stick blender clicks into. Perfect. However, a KitchenAid stand mixer is definitely a must have, and one that actually does stay out on my counter. I live in a sharehouse so there’s a bit of everyone’s stuff hanging around the kitchen. I am trying to keep to high quality versions of the things I use a lot – my two main appliances are my high speed blender and good food processor that I just got for xmas, however I definitely have some space killers like a large spiraliser and other such stuff. It’s easy to want ALL OF THE THINGS, haha. 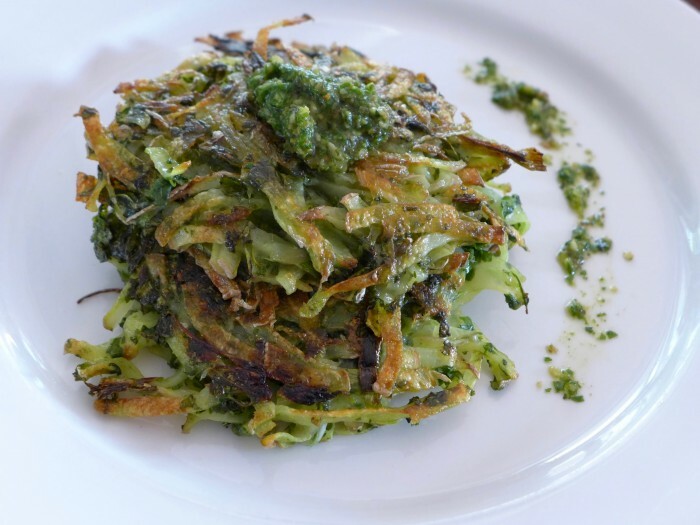 Love the latkes, I got given a massive box of rocket so think I might try something similar!